This article is a short summary of WarioWare Gold. WarioWare Gold is a title in the WarioWare series of Wario games that was released for Nintendo 3DS in Europe and Australia in July 2018, and in North America and Japan in August. 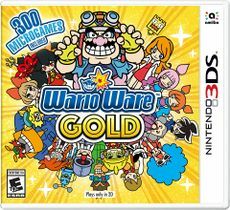 WarioWare Gold features 300 microgames total, some returning from past games and others original, the most of any title in the series. ↑ 2.0 2.1 Nintendo Direct 3.8.2018. Nintendo (YouTube; March 8, 2018). Retrieved March 8, 2018. ↑ メイド イン ワリオ ゴージャス [Nintendo Direct 2018.3.9]. Nintendo 公式チャンネル (YouTube; March 8, 2018). Retrieved March 8, 2018. ↑ Nintendo Direct - 08.03.2018. Nintendo UK (YouTube; March 8, 2018). Retrieved March 8, 2018. ↑ "Enjoy 300 strangely satisfying microgames when #WarioWareGold launches on #3DS on 28/07! #NintendoDirect" Nintendo AU NZ on Twitter (March 8, 2018. Retrieved March 8, 2018.